8x42 SIII LR. Illustration courtesy of Sightron, Inc.
Close inspection showed the one-piece optical tubes to be fully blackened inside and thread baffled. This binocular is ergonomically shaped, the open hinge is more comfortable than the usual roof prism binocular solid hinge and the center focus is smooth and easy to adjust. Pull up on the right eyepiece diopter correction ring to adjust; when the diopter ring is pressed down its setting is locked. This system prevents friends who look through your binocular from inadvertently changing your diopter correction setting, a worthwhile feature. Twist-up eyecups are my favorite kind of eyecup. They effectively block stray light and can be set for the proper eye relief. Eyeglass wearers will appreciate the 8x42's 18.4mm eye relief and the rubberized eyecups that, even when twisted-down, protect eyeglasses from scratches. 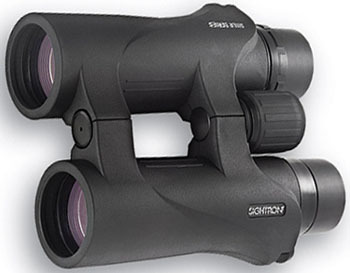 The Sightron SIII LR's are focused like other center focus binoculars. First, pick a suitable subject and close or cover your right eye and focus the binocular to your left eye using the center focus. Then, without changing the center focus setting, close or cover your left eye and focus the right eyepiece to your right eye. From then on, you can focus the binocular at different distances (for both eyes) using only the center focus. Visually, this binocular provides excellent views. I tested it by observing branches, cones, twigs and needles on fir trees at distances from 100 yards to 1000 yards. Such subjects, particularly when silhouetted against a bright sky, make good comparative tests of resolution and contrast. In every respect, the SIII LR 8x42 provided an excellent view. The color rendition is accurate, brightness is very good, contrast and resolution are very good, center sharpness is excellent and edge sharpness is good. Optical aberrations appear to be well corrected. There simply is not anything to dislike about this binocular, and a great deal to like. The already intense premium binocular market has gotten even more crowded. Those seeking premium binoculars should do themselves a favor and add Sightron to the list of names that includes the likes of Leica, Leupold, Nikon, Pentax, Steiner, Swarovski, Vixen and Zeiss. Exalted company in the world of optics, to be sure, but not an overstatement. Sightron's SIII LR Series binoculars are not inexpensive, but they offer quality and performance competitive with some binoculars costing twice the price. With a Lifetime Warranty and Sightron's reputation for excellent customer service, you simply cannot go wrong with Sightron SIII LR binoculars. Copyright 2009, 2012 by Chuck Hawks. All rights reserved.